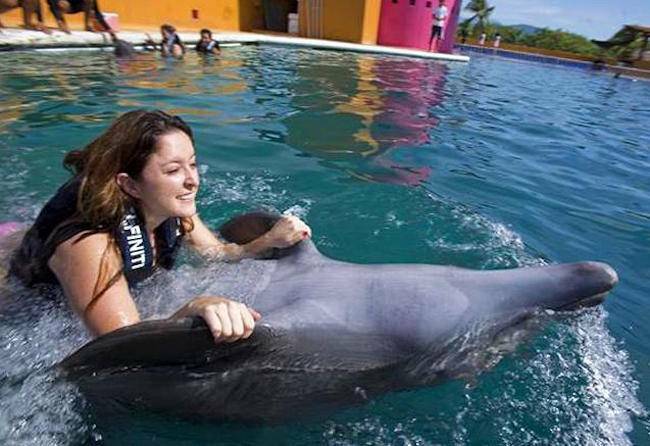 Dolphin and whale captivity has been banned in Mexico City as the public becomes increasingly aware of how they suffer. It’s official: dolphin and whale captivity has been banned in Mexico City, as the public becomes increasingly aware of how dolphins suffer when they are treated like objects and forced to perform degrading tricks. The countdown is now on for parks to find alternative homes for their captives. Last year, we reported that a bill that outlawed cetacean performances, training, and use in research or therapy was passed on August 1, 2017 thanks to the work of local nonprofits including Comarino Mexico. Now, as of May 5, facilities within Mexico City have exactly 6 months to find new homes for their captives or they will face fines. The facility within Mexico City’s jurisdiction is the notorious Six Flags Mexico, which placed number 6 on our Ten Worst Tanks list – a ranking that was cited by Environment Commission President Xavier López Adame as he gave justification for the aforementioned cetacean performance bill. The two bottlenose dolphins who are currently forced to live there must be moved out of the facility. The question remains as to where they will go. It is possible that they will simply be relocated to a different facility that will continue to use and abuse them. The best option would be to send them to a seaside sanctuary, where they can live out the remainder of their lives in relative peace and privacy without being forced to perform. There would also be the possibility of their release into the wild, if feasible. This is yet another example of how the captivity industry is being rejected by people around the world. Understanding of how harmful and exploitative captive dolphin entertainment is for both dolphins and humans continues to grow at a rapid pace.